For the people that happen to wander onto my blog, have a merry christmas! Because people always tend to have spare Champagne, here yet another simple cocktail to give it a little twist. Nothing hard about this cocktail, besides controlling yourself not to drink too many. Serve in a Champagne glass, and adjust the amount of Schnapps to your own liking. A very easy Champagne drink for the holidays (or whenever you feel like drinking one really). Serve in a Champagne glass, and if the carbonation of the Champagne doesn't do the trick, give it a little stir. Due some error in the code, there might have been some issues regarding posting comments. The captcha wouldn't come with a scroll bar so it would be impossible to fill out. I'm working on a fix, but untill then, it seems if people are logged in, in a google account, there is no need to fill in a captcha and all goes well. If there still are issues regarding comments, please leave me a mail using the contact button or direct to liquorists@hotmail.com. Feel free to post a comment under this post just to test if it works. Other news, because some health issues ( nothing problematic, just alcohol and medicine don't mix) there where no updates for a bit. Hopefully this will stay this way so i can get back to work again. So if people have suggestions, cocktails, drinks, holiday related things they would like to see here, just comment, or if that does not work, yet again, mail to liquorists@hotmail.com. Thank you for the possible effort and have fun during the holidays! A really easy cocktail, with no real known/important history. 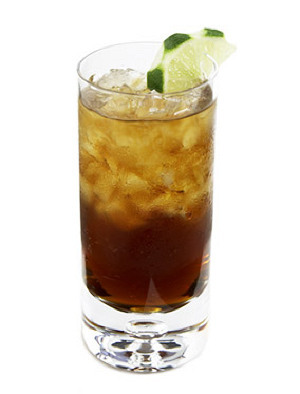 The drink itself should look just like the cubra libre in the picture. Just fill a glass with ice and add the ingredients, and stir it around a bit. Do not, repeat, not shake the drink. Carbonized ingredients and shaking don't mix well.